So far the diet has been helping alot, but I do miss chocolate! So I created this blondie recipe because as many of you busy moms know, trying to get in good, wholesome calories while running around with multiple busy kids can be a huge task! These blondies are great, as you can tweak them slightly to make them different. Ive made sunflower seed blondies, pumpkin blondies, blueberry apple blondies (not so blond anymore!). Today I want to share my coconut banana blondies. In a medium bowl, mix all the dry ingredients. In another small bowl,blend all the wet ingredients (I like using my blender for the wet ingredients). Thoroughly mix the wet ingredients with the dry ones. You can use a hand mixer for this if you like. 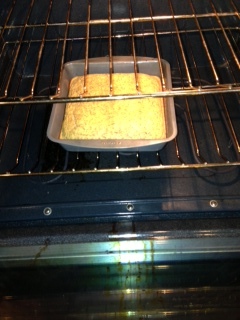 In a preheated oven at 350 degrees, bake in a greased 8X8 pan for 30 minutes or until golden brown. I cut these into 8 squares and individually wrap them in plastic. For breakfast I eat one of these with 1 tbsp sunflower seed butter!